How many times a day does a friend share a cool YouTube video, or song, or movie trailer with you? You watch it and then forget about it until something sparks your memory. Unfortunately, you didn’t save it, so you can’t remember what it was called. First world tragedy. Of course, you can avoid this problem by bookmarking the page, but the problem with bookmarks is pretty soon you have a giant pile of them and it’s too daunting to sift through to find what you really need. I’ve shared some resources in the past on how to stay organized with new bookmarking tools, most notably Pocket. Today, I want to share an amazing bookmarking tool called Minilogs. 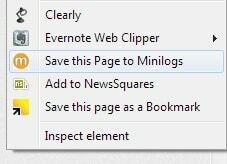 Like other bookmarking tools, Minilogs lets you quickly and easily bookmark items for future reference. What sets it apart though is what it bookmarks and how it organizes the bookmarks. Minilogs is essentially a universal playlist. You bookmark multimedia items from around the web and organize them in similar playlists. This allows you to quickly go back and find what you’re looking for. Plus, it makes for a great entertainment tool for you and your friends to enjoy. Imagine creating a playlist of 80s rock bands. You bookmark songs from Grooveshark, a station on Pandora and some Vimeo and YouTube videos. These are all in one convenient playlist, allowing you to head bang all night. 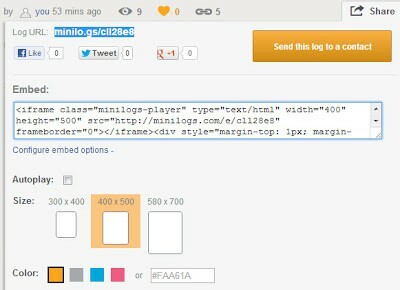 Creating a Minilogs account is free and easy. You can register with your Facebook account if you want. Once you’re signed in, you can create a playlist. You do this by clicking on the orange +New log in the top-right corner of the page. To get started, you need to copy and paste the URL to a site with a multimedia item on it. For instance, if it’s a YouTube video, copy the video URL in the address bar and paste it in the Create a Log field on Minilogs. Press Add. Your playlist is now created and should have that first multimedia item in there. To play it, all you have to do is press play. By default, your playlist doesn’t have a name. You can fix this by clicking in the Untitled text area and type a new name. You can continue to add multimedia items to your playlist by copying and pasting URLs into the Add a Link field at the top of your playlist. One of the things I like best about the playlist is how you can see where each item came from. This is done by looking at the little icon next to each item in the playlist. By default, your log is private. You can share it with people you want via the share button, but it is not public. To make your log public, you need to Publish it – a setting at the top of your playlist. You can also make your log collaborative (another setting), which lets others you designate add items to the log. 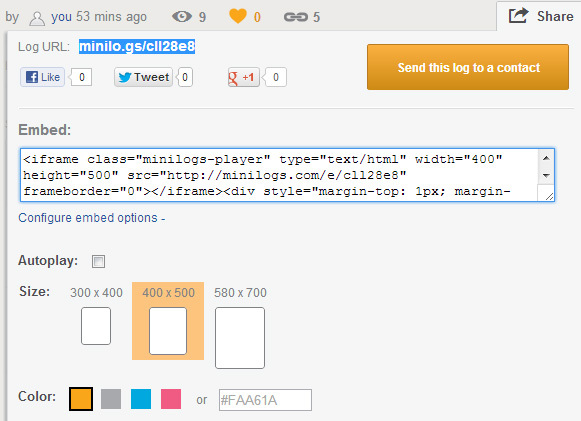 Minilogs is also a social network of sorts. You can explore other logs. You can show your support by “hearting” a multimedia item you like. 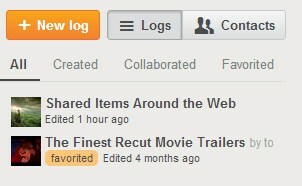 You can also favorite a log (click on the star next to the title). This will place the entire log in your playlists window. 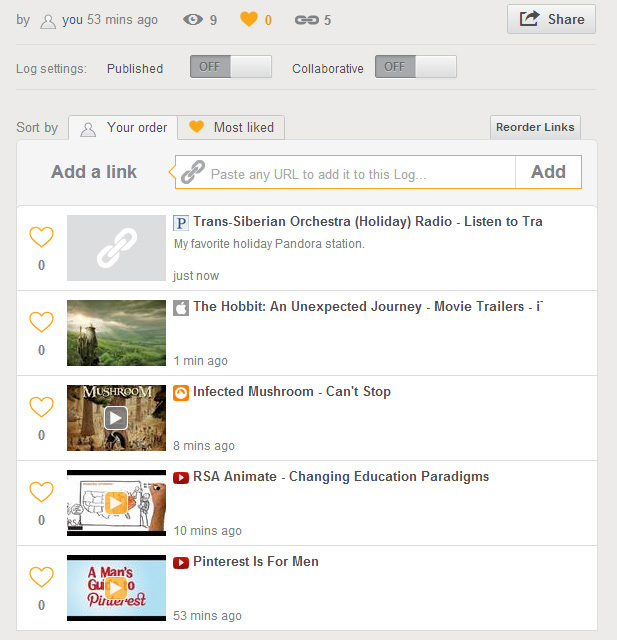 As you may have noticed, you can embed your log on another site, such as your blog. This way, your friends can see your log and experience your favorite things. This is better than other playlists because it doesn’t autoplay – a sin on par with drowning puppies. Copying and pasting links can be a pain though. Fortunately, Minilogs has a couple solutions. One is a bookmarklet, similar to Pinterest. You can download the bookmarklet here. Just click on the bookmarklet when you come along an interesting multimedia item and it will save it to your Minilogs account. The second, and better option, is for Google Chrome users – an extension with one-click functionality. You download this from the Chrome Web Store by searching minilogs and clicking on the Extensions option. Press the +Add to Chrome button to add the extension to your browser. Once this extension is in place, you have two methods of saving a new item. One is to click on the extension icon in the top-right corner of your browser. The other method is to right click on the page and select Save this Page to Minilogs. This is a service I’m sure you’ll find will get a lot of use. Plus, since it’s an online service, you can access your playlists from any computer. What will you make a minilog about? what you mean I' don't have to keep 50 tabs open at a time? this is actually pretty cool!